Sam’s Boat Gulf Coast Kitchen + Sports Bar restaurants is one of the longest running restaurant and bar success stories in Texas history. 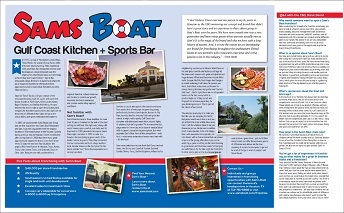 WHY SAM'S BOAT GULF COAST KITCHEN + SPORTS BAR? Sam’s Boat is now offering an exceptional opportunity for new franchisees to partner with us throughout the Southeastern US. We have an outstanding economic model and investment platform combined with crave-able Louisiana inspired food, world famous crawfish and an outstanding sports viewing package. The Sam’s experience is unique and the food, service, music and sports entertainment is why people always come back. 30 years later and going strong through franchising, get on board!